Three images from the Hubble Space Telescope reveal the birth of a Type 1a supernova, a “standard candle” for measuring the expansion of the universe. Nicknamed SN Primo, this supernova is the most distant of its type ever discovered. Astronomers have found the most distant Type 1a supernova, a kind of star explosion that should help scientists better understand the ever-expanding universe and the nature of dark energy, the strange force accelerating that expansion. Bursting into existence 9 billion years ago, the supernova (nicknamed SN Primo) was born from the violent death of a shrunken, super-dense star called a white dwarf. Light from such explosions falls within a very narrow range, which is why astronomers call them "standard candles." As the light travels toward Earth, astronomers can measure how it is stretched by the expansion of the universe. 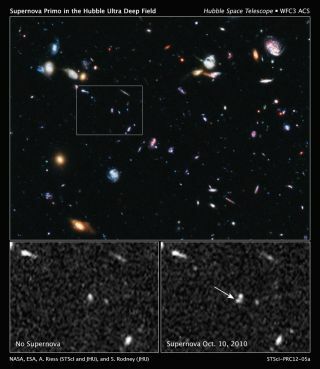 The team used the Wide Field Camera 3 instrument on NASA's Hubble Space Telescope to observe the supernova in near-infrared wavelengths over eight months. "In our search for supernovae, we had gone as far as we could go in optical light," said principal investigator Adam Riess, of the Space Telescope Science Institute and Johns Hopkins University, in a statement. "But it's only the beginning of what we can do in infrared light." "This discovery demonstrates that we can use the Wide Field Camera 3 to search for supernovae in the distant universe," Riess said. The CANDLES+CLASH team searches for ancient supernovae in an effort to understand if they’ve changed over the 13.7 billion years since the Big Bang, the dramatic event that gave birth to our universe. "If we look into the early universe and measure a drop in the supernovae, then it could be that it takes a long time to make Type 1a supernovae," said Steve Rodney, also of Johns Hopkins. If, on the other hand, such supernovae form quickly in the early stages of the universe, they should be plentiful. "Every supernova is unique, so it’s possible that there are multiple ways to make a supernova," Rodney said. If the Type 1a supernovae from the early universe look different than today’s explosions, the variations could provide more insights into dark energy. Riess was one of three astronomers awarded the 2011 Nobel Prize in Physics for the discovery of dark energy 13 years ago by studying Type 1a supernovae. The findings were announced at the 219th American Astronomical Society meeting in Austin, Tex., on Wednesday (Jan 11). Rodney is lead author on a paper detailing the results that has been accepted for publication by the Astrophysical Journal.